In SEO, reviewing content is an unavoidable yet extremely important task. As the driving factor that brings people to a page, best practice dictates that we do what we can to ensure that the work we’ve invested hours and resources into creating remains impactful and relevant over time. This requires occasionally going back and re-evaluating our content to identify areas that can be improved. That being said, if you’ve ever done a content review, you know how surprisingly challenging this is. A large variety of formats and topics alongside the challenge of defining “good” content makes it hard to pick out the core elements that matter. Without these universal focus areas, you may end up neglecting an element (e.g. tone of voice) in one instance but paying special attention to that same element in another. Luckily there are certain characteristics — like good spelling, appealing layouts, and relevant keywords — that are universally associated with what we would consider “good” content. In this three-step guide, I’ll show you how to use these characteristics (or elements, as I like to call them) to define your target audience, measure the performance of your content using a scorecard, and assess your changes for quality assurance as part of a review process that can be applied to nearly all types of content across any industry. Arguably the most important step mentioned in this post, knowing your target reader will identify the details that should make up the foundation of your content. This includes insight into the reader’s intent, the ideal look and feel of the page, and the goals your content’s message should be trying to achieve. What does my target audience look like? Why are they reading my content? The first question relies on general demographic information such as age, gender, education, and job title. This gives a face to the ideal audience member(s) and the kind of information that would best suit them. For example, if targeting stay-at-home mothers between the ages of 35 and 40 with two or more kids under the age of 5, we can guess that she has a busy daily schedule, travels frequently for errands, and constantly needs to stay vigilant over her younger children. So, a piece that is personable, quick, easy to read on-the-go, and includes inline imagery to reduce eye fatigue would be better received than something that is lengthy and requires a high level of focus. Are they reading for leisure or work? Would they want to share this with their friends on social media? Where will they most likely be reading this? On the train? At home? Waiting in line at the store? Are they comfortable with long blocks of text, or would inline images be best? Do they prefer bite-sized information or are they comfortable with lengthy reports? You can find the answers to these questions and collect valuable demographic and psychographic information by using a combination of internal resources, like sales scripts and surveys, and third-party audience insight tools such as Google Analytics and Facebook Audience Insights. With these results you should now have a comprehensive picture of your audience and can start identifying the parts of your content that can be improved. Now that you understand who your audience is, it’s time to get to the real work: assessing your existing content. This stage requires breaking everything apart to identify the components you should keep, change, or discard. However, this task can be extremely challenging because the performance of most components — such as tone of voice, design, and continuity — can’t simply be bucketed into binary categories like “good” or “bad.” Rather, they fall into a spectrum where the most reasonable level of improvement falls somewhere in the middle. You’ll see what I mean by this statement later on, but one of the most effective ways to evaluate and measure the degree of optimization needed for these components is to use a scorecard. Created by my colleague, Ben Estes, this straightforward, reusable, and easy to apply tool can help you objectively review the performance of your content. Note: The card sampled here, and the one I personally use for similar projects, is a slightly altered version of the original. As you can see, the card is divided into two categories: Writing and Design. Listed under each category are elements that are universally needed to create a good content and should be examined. Each point is assigned a grading scale ranging from 1–5, with 1 being the worst score and 5 being best. To use, start by choosing a part of your page to look at first. Order doesn’t matter, so whether you choose to first check “spelling and grammar” or “continuity” is up to you. Next, assign it a score on a separate Excel sheet (or mark it directly on the rubric) based on its current performance. For example, if the copy has no spelling errors but some minor grammar issues, you would rank “spelling and grammar” as a four (4). Finally, repeat this process until all elements are graded. Remember to stay impartial to give an honest assessment. Once you’re done, look at each grade and see where it falls on the scale. Ideally each element should have a score of 4 or greater, although a grade of 5 should only be given out sparingly. Tying back to my spectrum comment from earlier, a 5 is exclusively reserved for top-level work and should be something to strive for but will typically take more effort to achieve than it is worth. A grade of 4 is often the highest and most reasonable goal to attempt for, in most instances. A grade of 3 or below indicates an opportunity for improvement and that significant changes need to be made. If working with multiple pieces of content at once, the grading system can also be used to help prioritize your workload. Just collect the average writing or design score and sort them in ascending/descending order. Pages with a lower average indicate poorer performance and should be prioritized over pages whose averages are higher. Whether you choose to use this scorecard or make your own, what you review, the span of the grading scale, and the criteria for each grade should be adjusted to fit your specific needs and result in a tool that will help you honestly assess your content across multiple applications. 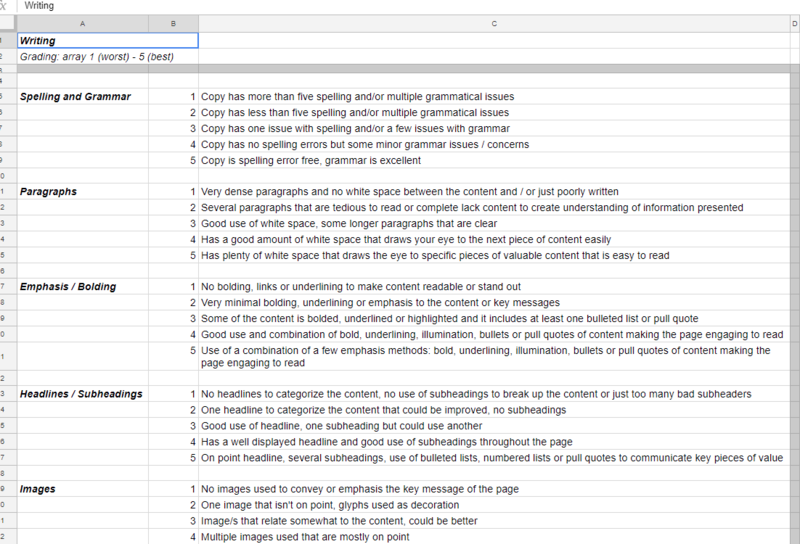 With most areas of your content covered by the scorecard, the last element to check before moving to the editing stage is your keywords. Before I get slack for this, I’m aware that the general rule of creating content is to do your keyword research first. But I’ve found that when it comes to reviews, evaluating keywords last feels more natural and makes the process a lot smoother. When first running through a page, you’re much more likely to notice spelling and design flaws before you pick up whether a keyword is used correctly — why not make note of those details first? In the first example, the keywords you originally target are still best suited for your content’s message and no additional research is needed. So, your only remaining task is to determine whether or not your keywords are effectively used throughout the page. This means assessing things like title tag, image alt attributes, URL, and copy. In an attempt to stay on track, I won’t go into further detail on how to optimize keywords but if you want a little more insight, this post by Ken Lyons is a great resource. If, however, your target keywords are no longer relevant to the goals of your content, before moving to the editing stage you’ll need to re-do your keyword research to identify the terms you should rank for. For insight into keyword research this chapter in Moz’s Beginner’s Guide to SEO is another invaluable resource. At this point your initial review is complete and you should be ready to edit. That’s right. Your initial review. The interesting thing about assessing content is that it never really ends. As you make edits you’ll tend to deviate more and more from your initial strategy. And while not always a bad thing, you must continuously monitor these changes to ensure that you are on the right track to create a highly valued piece of content. Am I still addressing the needs of my target audience? Are my target keywords properly integrated? Am I using the right language and tone of voice? Does it look like the information is structured correctly (hierarchically)? If your answer is “Yes” to all four questions, then you’ve effectively made your changes and should proceed. For any question you answer “No,” go back and make the necessary corrections. The areas targeted here become more difficult to fix the closer you are to completion and ensuring they’re correct throughout this stage will save a lot of time and stress in the long run. When you’ve finished and think you’re ready to publish, run one last comprehensive review to check the performance status of all related components. This means confirming you’ve properly addressed the needs of your audience, optimized your keywords, and improved the elements highlighted in the scorecard. No two pieces of content are the same, but that does not mean there aren’t some important commonalities either. Being able to identify these similarities and understand the role they play across all formats and topics will lead the way to creating your own review process for evaluating subjective material.